Winter may, technically, be over but the cooler weather that's been clinging to much of Australia for the past few months doesn't appear to have given up the ghost just yet. So no doubt there will be plenty happy to welcome another stout into the world. 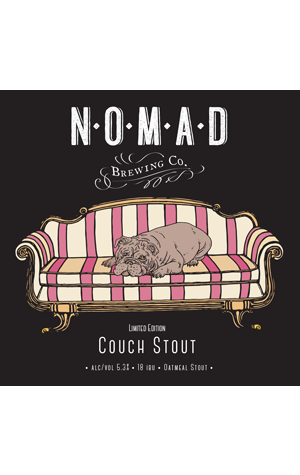 Couch Stout is an oatmeal stout from Nomad of Sydney's Northern Beaches and was conceived by co-founder Leonardo di Vincenzo (Birra del Borgo) as a "coccola", which means cuddle or caress as far as we can discern but in this case indicates "a comfortable stout that you can put your feet up to". Thus oats were added to grain bill for added smoothness and a touch of sweetness alongside the more typical roast and cocoa characteristics. According to the Nomads, it has "enough warmth and chewiness to make you feel cuddled but [is] still quaffable enough to drink a few."